2014 East Pacific: The dance of the storms! This Friday 22 August marks the 99th day of the 2014 East Pacific hurricane season, which ‘officially’ launched on 15 May, and as if to highlight the occasion Tropical storm MARIE the 13th-named tropical cyclone of the season is now active off the coast of southern Mexico. 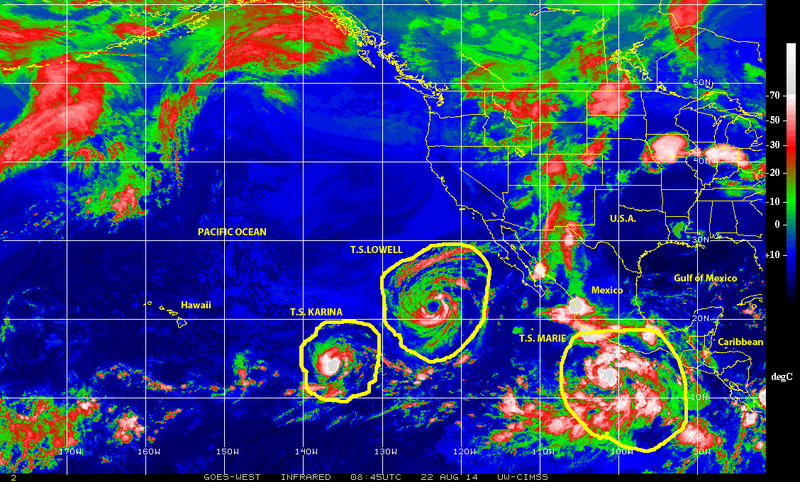 There are in fact three tropical storms simultaneously active over the Eastern Pacific near the coast of Mexico. 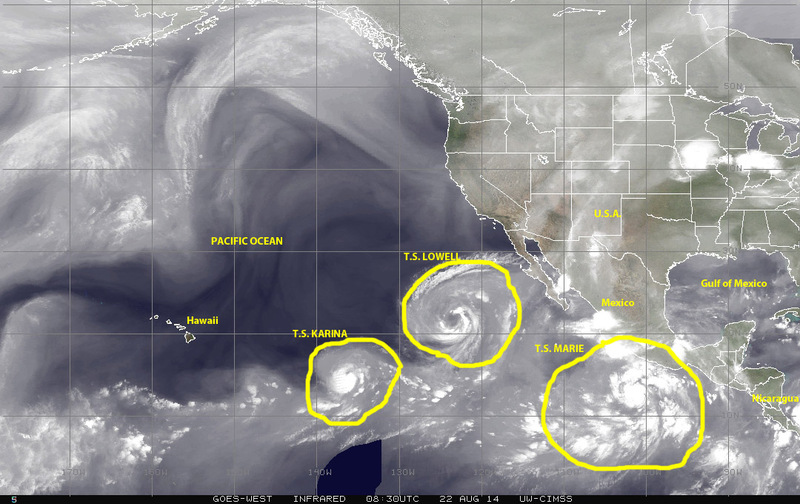 KARINA, LOWELL and now MARIE, three tropical cyclones doing the ‘dance of the storms’ in the East Pacific basin. The East Pacific region has been particularly active in 2014 averaging one named-storm per week (roughly every 7.6 days) since the start of the season. In addition to the three tropical storms currently active, the region to the east-southeast of tropical storm Marie reaching into the Gulf of Panama and northwestern South America is populated by numerous tropical waves and storm cells, in a patterns that has persisted for most of this season and over the past several years. It appears many of the tropical waves coming out of Equatorial Africa and across the southern fringe of ‘hurricane alley’ are coming across over the northern region of South America and the Panama isthmus into the East Pacific sub-basin. By contrast the 2014 Atlantic hurricane season, now in its 83rd day, has only spawned two named-storms so far although we are now monitoring a disturbed weather system making its way toward Puerto Rico and the Virgin Islands today, which is showing signs of getting better organized and stronger with a potential for cyclonic development in the next day or so; we could be looking at the third named storm of the season. But we will have to keep watching this system to see if it will become Cristobal. Today is Thursday the 21st day of August 2014 and out there at the western end of ‘Hurricane Alley,’ NOAA’s National Hurricane Center [NHC] continues to monitor an elongated array of storms that is showing signs of getting better organized, and a medium potential for cyclonic development as it moves NNW toward the Caribbean Sea. It’s been a slow season so far in the Atlantic basin. More than two and a half months into the 2014 season, which officially started on 1 June, we have had only two-named tropical cyclones in the basin, Arthur (1 July) and Bertha (31 July). The system we are now monitoring could become the third-named tropical cyclone of the 2014 Atlantic Hurricane season, Cristobal, should development continue as it moves into the warmer waters of the Caribbean. 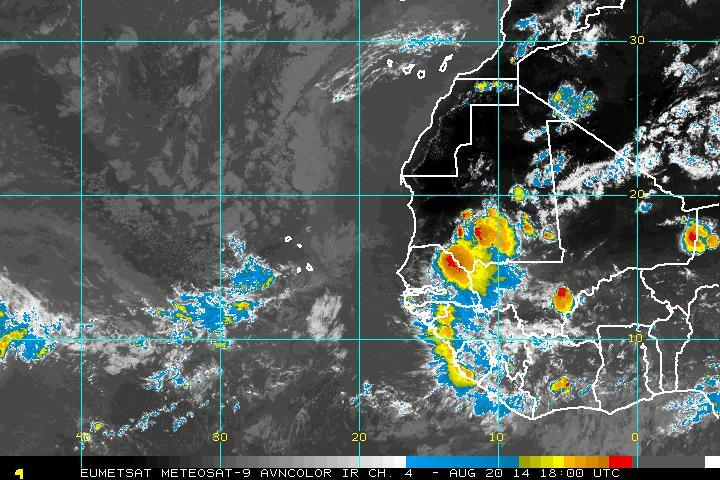 Farther to the east near the Cape Verde Islands and over Equatorial Africa the ‘tropical wave assembly line’ has slowed down somewhat in recent days so we do not see much traffic feeding into ‘hurricane alley, off the coast of Africa, at least for the next couple of days. Over in the Pacific ocean it has been a totally different story, specially over the Eastern Pacific where we have basically had one tropical cyclone per week since Amanda generated on 21 May barely one week into the 2014 season that officially started on 15 May. Currently two tropical storms, number 11 Karina and Lowell the 12th of the season, are moving off the coast of Mexico. At the same time the region from the Gulf of Panama to the waters off southern Mexico, which has been a veritable tropical cyclone nursery, continues to be populated by numerous tropical waves, cells of disturbed weather and plenty of rain and thunderstorms. This northern hemisphere East Pacific basin continues to be connected via a ‘belt of tropical activity’ with the West Pacific basin over the Philippines Sea and beyond, more than 15,000 kilometers from the coasts of Central America to the Philippines, where we have seen a total of twelve-named tropical cyclones including a couple of super-typhoons since Lingling spawned in mid January 2014 to the birth of tropical cyclones Nakri generated a couple of weeks ago on 4 August. The 2014 Atlantic season is entering its historical peak, which takes place in September, as it reaches toward its mid-point at the end of August. The East Pacific basin just passed it mid-point mark last week, and it is ahead by a count of 12 to 2 versus the Atlantic basin in terms of the number of tropical cyclones generated so far in 2014. But this is not about keeping score, for in the end what really counts is how much damage and human suffering these natural phenomena we know as tropical cyclones may cause. In this regard it is critically important to keep in mind that all it takes is just one hit on a populated coastal region, and we may see plenty of damage. So we must all pay attention, remain alert, be prepared and always engage in the practice of mitigation!